The central Europeans, the bloodsuckers of the European Union? Western European rhetoric making Eastern Europeans the profiteers of the European Union overlooks another economic reality. Interview with the economists Filip Novokmet (Paris School of Economics) and Pawel Bukowski (London School of Economics). This interview was published in french on Le Courrier d’Europe centrale. 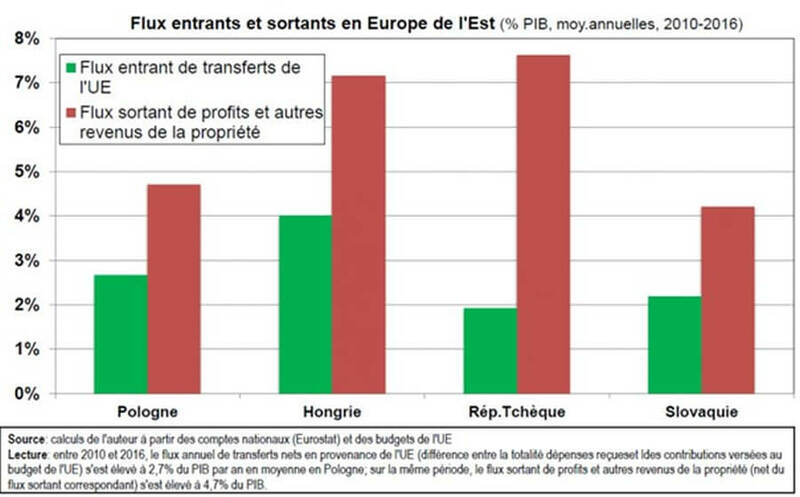 The French economist, Thomas Piketty, has published a chart, based on your research, showing that the profits and revenues from property leaving the countries of the Central European region represent a much bigger amount than the input of EU funds. Can you comment on this? The chart points to the essence of the development model in post-communist Central Eastern (CE) Europe, which has been based upon political and economic integration within the EU. The convergence strategy of these countries was based on the inflow of foreign capital. It played a key role in bringing jobs, new technologies and know-how, which improved productivity and helped the restructuring of these economies. On its side, foreign capital, coming primarily from Western Europe (particularly from Germany), has been attracted by relatively low-wage and skilled labour, low corporate taxes, proximity and low institutional risk due to the EU integration. The model itself has been quite successful in increasing GDP per capita, which is the most commonly used indicator of living standards. However, averages such as GDP are silent on the distribution of the growth. The high level of foreign direct investments (FDI) contributed to the GDP growth, as it brought new jobs and increased productivity, but at the same time implied a sizeable portion of profits going to foreign investors. So, while there is no doubt that the ‘pie’ has increased, the question it is rather how it is sliced, that is, how gains are shared and to what extent has growth benefited average households? Probably the most intuitive way of looking at this trade-off is to compare the development of real productivity and wages. A rise in productivity is the only way to increase living standards in the long run, which is usually translated to the majority of people through higher real wages. However, average wages have lagged behind the productivity growth in CE Europe, or there was a ‘decoupling’ between the potential for rising living standards and the actual rise. (Figure 1, the top row) Our ongoing work shows this trend for Poland, the Czech Republic and Hungary, where the cumulative rise in labour productivity (defined as produced output per hour) has outpaced the cumulative growth in real wages. Although workers have witnessed a substantial improvement in their real income, they have received relatively less and less from what they have produced. By definition, the growing wedge between productivity and wages is reflected in a declining share of labour incomes in the total income. In other words, productivity gains have been increasingly going to capital owners rather than workers. And disproportionately to foreign owners, as the data shows that foreign companies have a markedly lower labour share (Figure 1, the bottom row). One could think of various reasons usually mentioned for the declining labour share, from capital-biased technology, globalization, eroding bargaining power of labour to financialization. And probably all of them played a certain role in inducing this trend. But this also suggests that the political implications of the larger importance of foreign capital in CE Europe can be significant, especially with respect to its impact on inequalities in the future. And these challenges should be at least considered, whether one considers the scenario of Thomas Piketty’s Capital in the 21st century, where economic forces of capital accumulation lead to rising capital share and, in turn, to rising inequalities, but here rising capital income goes to foreign rather than domestic capitalists. Or a less ‘natural’ scenario, hinted at in his recent column in Le Monde, when high capital shares partly stem from the higher market power. This way, large capital outflows also indicate excessive profit margins, and a comparison between capital outflows and EU funds inflows could then actually be seen in a cost-benefit perspective, as conveyed by the chart. How does the domestic economy cope with the weight of foreign capital? Common patterns across countries might suggest that the greater market power of foreign companies is one common source of the declining labour share in CE Europe. Much higher productivity of foreign firms in CE Europe (see Figure 1, the bottom row) has given them a wide competitive edge, empowering them with substantial market power. This is also reflected in the wage-setting process, which has allowed foreign firms to keep wages low and earn higher profit margins. With low domestic wages or the weakest labour bargaining power in the EU, foreign companies are facing relatively weak upward pressure on wages. Multinationals can thus pay a slightly higher wage than domestic firms, but still less than what they could potentially pay. Generally speaking, the market power of foreign firms has not been challenged by the domestic sector, which is characterized by relatively low productivity and often faces high entry barriers (e.g. high cost investment, scale economies, R&D, etc.). Notably, being a part of the global value chains, foreign companies do not build a supply chain in the host countries, which limits productivity spillovers into domestic sectors. And here lies, in our opinion, the main challenge to the current development model. It seems that the domestic sector has been left far behind, characterized by small firms and low productivity. There is a growing fear that the convergence model based on foreign investment might have run out of steam and that it may result in the ‘middle-income trap’. Namely, there are voices saying that the region risks getting stuck with a reputation as the low-cost manufacturing hub of EU, specialized in low-value added activities in the global value chains. The sustainable growth is difficult to achieve with the region basing its competitiveness primarily on the low production cost and ‘business-friendly’ low taxation environment. In order to achieve convergence with high-income countries, just importing technology is not enough and instead the innovative-led growth is the key. A share of European funds directly benefits large foreign companies, whose profits are returning to their home countries, or go offshore. Can we measure this share? This possibility would be very controversial. But we would not be surprised if this practice has been prevalent since CE European countries have overtly advertised the benefits of EU funds in order to attract foreign investment. Following on what has been said, the paradox is that this might further improve technological competitiveness of foreign corporations over the domestic sector, translating into still higher market power. In addition, the low use of EU funds for domestic R&D means that the domestic sector might lag even more behind foreign counterparts. But it is difficult to empirically capture the magnitude of the problem. And this is probably not quite transparent in the first place as it clearly raises a reputational issue for multinationals. One attempt at measuring this is a detailed case study analysis done by Financial Times and the Bureau of Investigative Journalism a few years ago, which found big beneficiaries of EU funds such as IBM, Fiat, or even some arms manufacturers. Regarding the repatriation of profits from CE Europe, we should also keep in mind the effect of the booming global tax-dodging industry. As multinationals (artificially) shift an increasing part of their profits to tax havens, in these murky cash flows it is not very clear how home countries benefit from these profits. After paying very low or no corporate tax in CE Europe, profits are shifted to tax havens such as Ireland, Netherlands, Switzerland or Luxembourg. Governments of parent countries in West Europe probably don’t receive much, if anything. This primarily benefits shareholders owning these corporations, which is an important factor in driving global inequality. Do your results lend credence to the (very political) interpretation that Central and Eastern Europe is a peripheral area operated by a dominant center? We would not go that far, at least, in understanding the core-periphery relationship as traditionally done, for example, by the Dependency theories. Importantly, in this respect, the current convergence model based on foreign capital has clearly not led to the ‘underdevelopment’ in CE Europe, but quite the opposite, the CE’s growth has been quite impressive. Maybe one tempting similarity is, as mentioned, the risk of getting stuck in a specific specialization mode within the European-based global value chain centered around Germany. High-value added operations (such as design, sale, and marketing) have become a domain of the ‘center’, while low-value added fabrication has been out-shored to the ‘periphery’. Higher innovation can move countries up along the value-added chain and countries themselves must make a great effort in this direction. Brussels has been often demonized in CE Europe as the materialization of these assumed (vested) interests of the core to keep the region as the economic periphery. This is, in our opinion, an exaggeration, but the EU institutions are often themselves to blame for offering this impression. For instance, recommendations of not increasing wages to retain competitiveness many be interpreted as the EU places greater value on the interest of foreign capital. Or a similar observation might be made about policies that are perceived as promoting (neoliberal) market fundamentalism or the increasing evidence of power politics. Instead, the EU should actively try to democratize the model. Balancing bargaining power with multinationals can be achieved by a more coordinated fiscal policy, e.g. the common corporate tax. Preventing the ‘race to the bottom’ would allow governments to invest tax revenues in innovation-based growth through, notably, education. Today we speak of a “repolonization” of the economy in Poland. Just as Hungary began in the early 2010s reducing the share of foreign capital in some sectors of its economy. Is the capital held by foreigners significantly larger in Central Eastern European economies than elsewhere in the EU? Capital held by foreigners is indeed more important in CE European economies, primarily with respect to the ownership of the corporate sector. Its higher prominence is revealed by many macroeconomic indicators, such as its share in the gross value added, sales or exports. Correspondingly, the total market value of corporations in foreign ownership exceeds the total market value of national private companies in CE Europe, suggesting that the most profitable sectors are owned by foreigners. As noted, this should be seen as a result of the deliberate development strategy where convergence has been based on the foreign capital. And to some extent, lower foreign capital inflows after the global crisis have stalled the development model based on FDI and the need for the alternative has become rather pressing. A growing talk of ‘repolonization’ and similar trends in CE Europe are partly due to this slow-down. But it is not clear why it should be taken for granted that ‘national bourgeoisie’ would be more patriotic or that the domestic-led growth would be more inclusive. Take Russia, for example, where more substantial foreign ownership has never been an option. There, inequality has exploded as billionaires and oligarchs assumedly loyal to the Russian state earn exorbitant profits and their wealth often comes from the outright plundering of country’s natural resources or foreign reserves. How patriotic is the fact that rich Russians have taken as much financial wealth abroad to various offshore centers than held by the entire Russian population in Russia itself? Actually, the contours of growing ‘cronyism’ are already visible in Hungary under the national populist government, for instance, in re-nationalised public utilities sector or in the often-quoted misuse of EU funds, the reallocation of which has been based not only on economic, but also political premises. Similarly, many large domestic companies in Visegrad countries also enjoy state-protected rents, often originating from public services and procurement, as well as widely used tax optimization in tax havens. The new ‘patriotic revival’ in Poland must be also confronted with the fact that the strong growth of Poland’s national income has not been especially inclusive. We find that it went mostly to the domestic (resident) top income groups, such as the top 1%, predominantly composed of business owners. Actually, the Polish domestic sector has been more prosperous and significant than in other CE countries – mostly due to the larger size of the domestic market – and thus the dependence on foreign capital has been sometimes (deliberately) exaggerated. Plausibly, foreigners and foreign capital are easy targets for populist attacks. 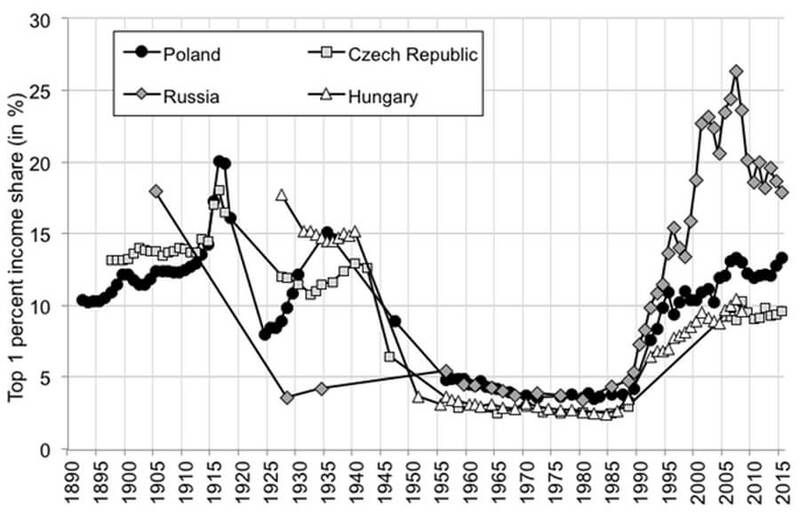 Thomas Piketty writes that “if inequality has increased less strongly in Eastern Europe than in Russia or the United States, it is simply because a large part of the high income from East European capital is paid to ‘foreigners'”. Can you develop on this? What are the disparities within the Central/Eastern Europe region? As said, within CE Europe, Polish top income shares seem to be higher than in other countries. For example, the top 1% income share in Poland is today at the levels around 14 per cent of the total income, while in Hungary or the Czech Republic, top 1% shares are slightly below 10% (see Figure 2). In Slovenia, for instance, top shares are still lower, between 6-7% of the total income. We also observe differences in the income composition of top income groups, where Poland shows a relatively large share of capital incomes. Visegrad countries, however, are much more similar to each other than to their eastern neighbours. Russia stands out as an example of extreme inequality in the international perspective, with top percentile share at levels around 20 per cent. Unfortunately, we do not know what the development has been in other Eastern Europe countries, such as in Ukraine, but based on some indirect evidence it is plausible to surmise that inequality there more resembles the Russian scenario. How have they evolved since 1990? After the fall of communism top incomes experienced a substantial and steady rise. The initial upward adjustment during the transition of the 1990s was induced both by the rise of top capital and labour incomes. A somewhat more pronounced rise of Polish top income in 2000s was to a larger extent driven by the rise in top capital incomes, which make the dominant income source at the top. What is the driving force behind these inequalities? The first years of transition from socialism to the market economy were featured by the rise in earnings inequality and private income concentration. An overall rise in wage inequality was largely due to decentralization of the wage determination, as higher education/productivity has become more rewarded than before. Concentration of capital income is plausibly related to the creation of the private sector, with different paces, methods and scales of privatization partly explaining this development. Finally, extensive social transfers played an important role in mitigating the sharp rise in inequality in CE Europe during the transition shock. Here lies another reason for inequality divergence between CE Europe and Russia. In Russia, social transfers were less extensive and poorly targeted. We relate recent developments in inequality to processes associated with globalization, in particular, as noted before, to its potential relationship to the rise of the capital share (or fall in the labour share). Since capital income is generally quite unequally distributed, this rise could have been captured by top income. Can we say that, in general, inequalities are now more pronounced in the former socialist countries than in the rest of the European Union? As noted, there are differences among countries, so Poland exhibits levels similar to countries characterized by higher top income shares in the European context, such as Germany or the UK. Other Visegrad countries show similar levels to Continental or Southern European countries, while countries like Slovenia display levels similar to more egalitarian Scandinavian countries. On the other hand, Russia has experienced a striking rise of inequality, which has far surpassed European levels and reached those observed in the US and other world inequality leaders. Note: The top row. Productivity is gross value added in non-financial corporations divided by the total number of hours worked and deflated by the GVA deflator. Wages are defined as the total payroll (excluding non-wage compensation) in non-financial corporations, divided by total hours worked and deflated by the CPI. Source: OECD. The bottom row. Productivity is defined as the gross value added in the total economy produced by either domestic or Rest-of-the-World controlled companies, divided by corresponding number of persons employed and deflated by the GVA deflator. Compensation is defined in an analogous way, except it is deflated by the CPI. Source: Eurostat.